I am sorry I haven’t been posting for a while now…But I have good reason. I am moving to sunny England in June. 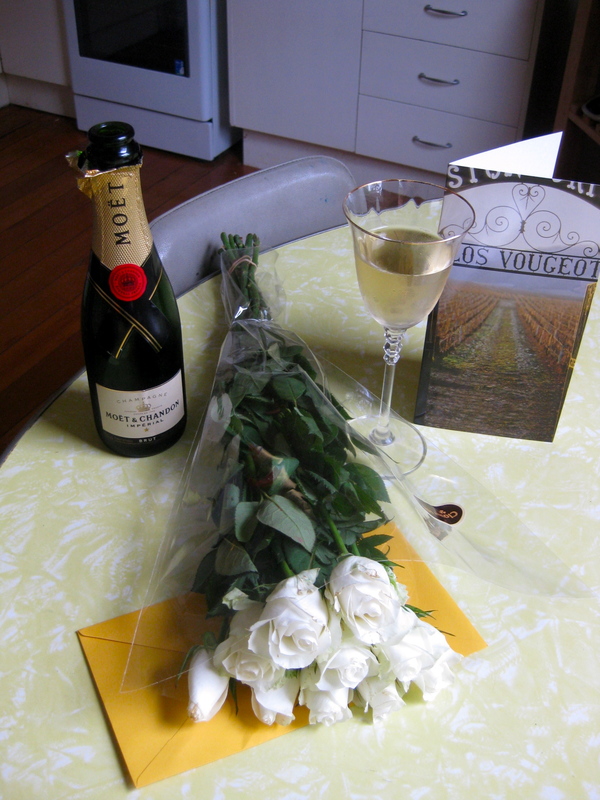 AT surprised me with champagne and roses on the day we got our visas approved. Our tickets are booked and my belongings are being categorised into ‘pack and take’ – ‘keep and store’ the rest is being either being dumped, sold for a pittance on ebay or given to friends. The kitchen has not been the hive of activity it once was and it does make me a little sad. I have been so busy with MOTIF Magazine and other work commitments that I have not even had time to bake. Very sad. But I am slowly reducing my commitments and I shall be back in the kitchen soon. I am going to make some sort of yeasty scroll in the holidays, I will try some more cookies from my new recipe book and I will try and get together my birthday cake bonanza post. I have to come up with something fantastic for Issue 3 of MOTIF Magazine, that we’re trying to wrap up well in advance as both Tegan and I will be travelling on the date Issue 3 is to be released. If you haven’t yet had the chance please check out Issue 2 – INTO THE WOODS where you will see my mushroom risotto, strawberry shortcake with a twist and read all about scrumping! So here is the scene from my kitchen in Sydney, Australia. 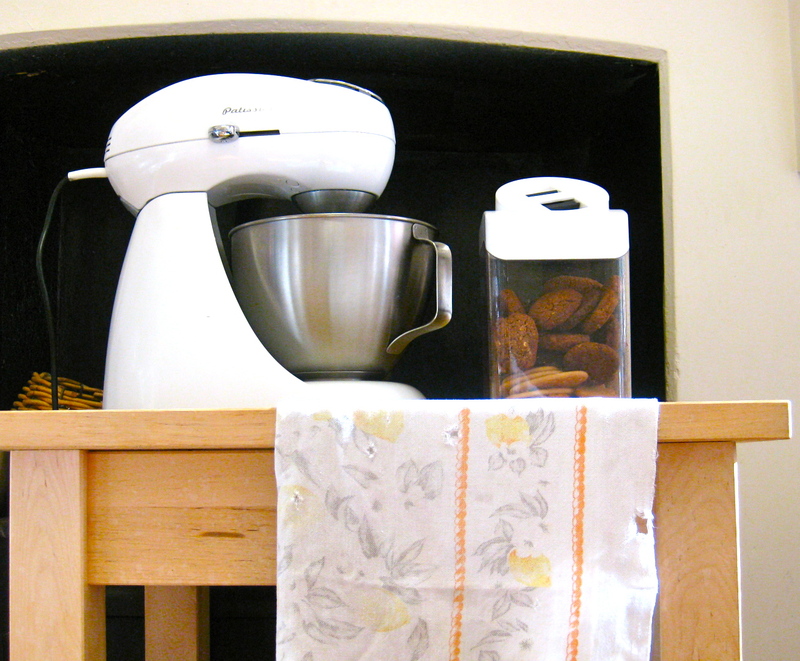 My favourite mixing machine, my butcher’s block, a cookie jar of homemade treats and my treasured threadbare tea towel. I am full of wonder as to what kitchen I shall be baking in when I get to the UK. I’m wondering how I’ll manage without my mixer… I think I’ll manage just fine without the crappy stove I inherited when my super-duper black one packed it in. And, I wonder what sort of food I will be cooking, buying, tasting and maybe growing. I can’t wait to eat fresh baby leeks in the spring and apples picked straight from a tree. I will do as the Romans do and make Yorkshire pudding and eat my scones with clotted cream. Watch this space readers, because I am taking my cooking adventures with me. As I write this I can smell the lemon aroma from the kitchen because I’ve just pulled my lemon-yoghurt cake out of the oven. I have macaroni bubbling away on the stove for dinner tonight. Little L is dressed as Batman and sitting on the couch crunching on his apple. All is well. Just as it should be! !